Pictorial maps are often used in marketing and advertising. They have little function other than to encourage people to pause a while and explore…and possibly to then make some association with the product or service offered. Pictorial maps are perfectly suited to this need because they combine maps and map-like imagery with other illustrations designed to capture attention and captivate. Lucien Boucher produced a number of pieces for Air France in the early 20th century which were advertisments for the global coverage and glamour of air travel at the time. This version, from 1938, combines a subtle outline map with key places with a celestial planisphere that shows the various signs of the zodiac. The suggestion is of fantasy and the experience you’ll have flying. It’s designed clearly to capture the imagination and provide a strong brand message. Actual linear flight routes are superimposed across the map to place Air France clearly amongst the imagery and to situate it both graphically and in the minds of the reader. This is a very stylised approach to advertising that combines maps with other rimagery to create a memorable, high-impact product. 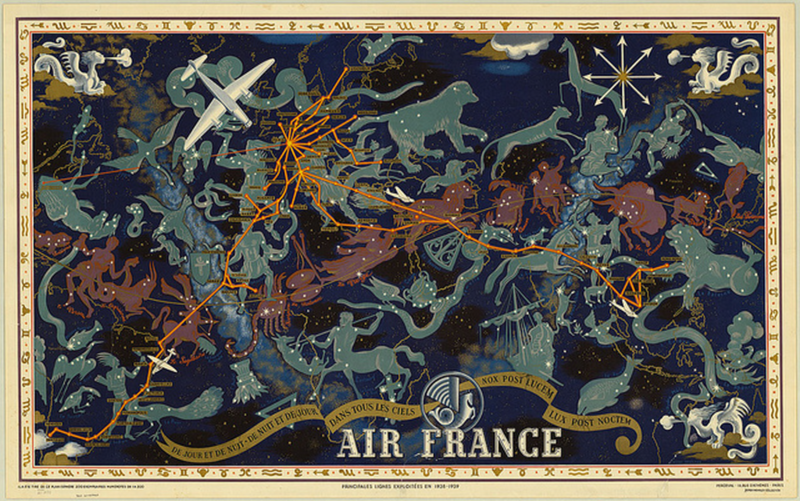 More of Boucher’s maps for Air France can be seen at the David Rumsey Map Collection here.